One of the great pleasures of stumbling upon cycling later in my life is that so many ‘old’ things in our sport are, in fact, new to me. 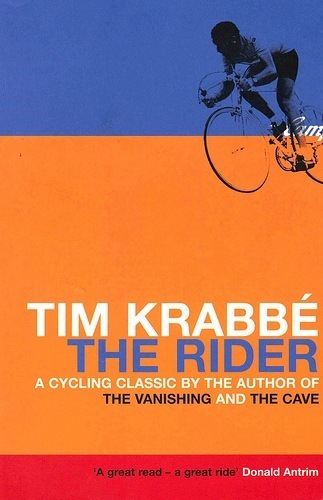 There’s no better example than the cycling cult classic, The Rider – a must read for every cyclist. Written in first person by Dutch novellist and, of all things, chess enthusiast Tim Krabbe way back in the 1970s, I’ve just finished reading it. Structured around the author’s fictitious participation in a 137km one-day race, the Tour de Mont Aigoual (“the sweetest toughest race of the season”), and interspersed with a superb array of anecdotes and one-liners, I loved every page and spent a lot of my time fumbling to find a pen to jot down some of Krabbe’s truly wonderful observations of our truly wonderful sport. Clearly this is a man who knows, and loves, his cycling. For the insights Krabbe is able to share are quite uncanny. On numerous occassions it was as if he could read my mind and my emotions on the bike – not bad considering he wrote the book nearly 40 years ago. But that’s the thing. It might as well have been written in 2013. It’s that good. Oozing with charm, intrigue, wit and a rather bizarre section towards the end that must surely have been written in one of Amsterdam’s famous brown cafes where he describes a variety of riders, famous and otherwise, The Rider explores the motivations, the pleasures, the pains, the tactics, the rivalries and the frustrations that make road racing one of the toughest pastimes on the Planet. It’s remarkable to think it’s a work of fiction – it all feels so real. My only complaint is that I wish it was longer than 148 pages. Like many of my own races, it was over way too quickly. Note: I actually had a bit of trouble finding the book at first. Doesn’t seem to be available in digital format (from the usual places, anyway). I ended up getting a paperback copy through Amazon.